Did you know that wet cell phones may be salvageable.? The key to success is acting quickly, using solutions that have been proven effective, and avoiding behavior that might cause further damage. In order to show the tips, for any in-person interviews, bring a phone that has a removable battery. Many people’s worst nightmare is seeing their trustworthy smartphone plunge into water, so they have temporary shock. According to a recent U.S. Cellular survey, 65 percent of people would rather live without TV than without their smartphone. The key to success is act quickly to avoid further damage. Don’t panic, and retrieve the phone as soon as possible. Many people worry that contacts, photos and other data may be gone forever. Their first reactions are sometimes to frantically press all the buttons, attempt to fix it with a hair dryer, or even stick it in the oven to dry. However, none of these options have been shown to work that well. Act fast. Retrieve the smartphone as quickly as possible, taking it out of the water right away. The longer it’s submerged in liquid, the more likely it is to be irrevocably damaged. Take out the battery. Don’t “test” the phone to see if it still works by turning it on and off because pressing the screen and buttons could push liquid farther into the device. The critical first steps are to power off the phone and take out the battery. If the phone, such as the iPhone 6s, doesn’t have a removable battery, power off the device right away to prevent a possible short circuit. Remove any accessories. Take off any cases or covers, and remove all memory cards, headsets or other accessories. Take out the SIM card and carefully dry it off with a soft towel or cloth. The SIM card may retain data even if the waterlogged phone itself is damaged. Wipe down the smartphone. Carefully wipe the phone with a clean, soft towel or cloth. Try to avoid getting water into the phone’s cracks, indentations, ports or other openings. If water is trapped in a crevice, use a can of compressed air to blow it out, taking care not to blow the water further inside the phone. Use a fan. A fan can blow air across the phone's openings to help dry it out, so keep it blowing for at least a few hours. Take the phone to your wireless carrier. If these methods don’t effectively fix the phone, don’t despair. Sometimes it can be fixed even when home remedies haven’t worked. Be honest about what happened and walk an associate or technician through the steps that were already taken to try and fix it. Don’t use heat. It may be tempting to use a hair dryer, microwave or oven to dry off the phone, but the heat can quickly warp the phone's circuits and melt its delicate internal components. Have a backup plan. Most people will submerge their smartphone in water at some point, so be prepared by stocking up on products that have been proven to work. 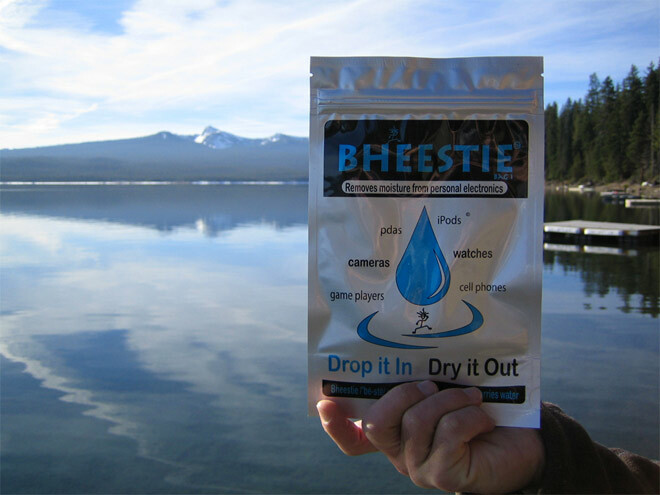 Solutions like the Bheestie Bag or Dry-All are specifically designed to dry out wet mobile devices. These products can often prevent lingering moisture that can do further damage to the phone. Hoard desiccant packets. Whenever free desiccant packages (such as silica gel) come with orders of shoes, electronics or other products, save them. Pour their contents into a container with an airtight seal. When a wet phone needs rescuing, place it in the container and the desiccant can help absorb the water. The most important step people can take, even before the phone gets wet, is to make sure important data, photos and contacts are backed up. If the phone is not recoverable, at least your important information and memories are saved. You may want to consider insuring your device. U.S. Cellular offers Device Protection+, which not only replaces a water-damaged phone, but also comes with tools to backup your data and protect against Malware.